Despite a nearly 14% rally retail traders are still buying puts at a level only seen 3 other times in the last 7 years. At the bottom in 2008, After the flash crash in 2010 and again last Oct. Not surprisingly every one of those occurrences was at a major bottom. 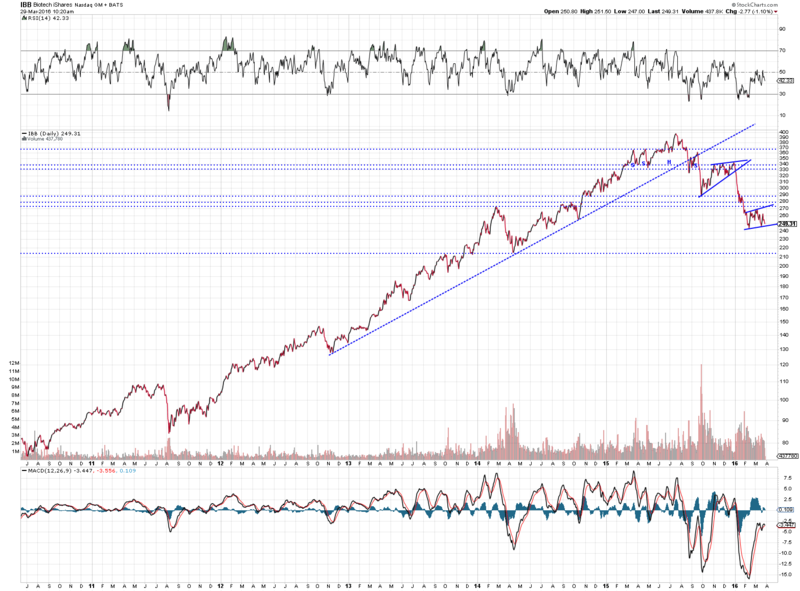 The difference now is that they are still exhibiting extreme bearish behavior after such a strong rally. These are the traders that are notoriously wrong at every major turning point. This means there is lots of fuel to drive the bubble phase. Future’s are up, runaway starts tomorrow?.. Way too early to tell yet. Still a possibility for DCL, or its out of the way by now? Still time. Only on day 31. Seasonality..April always strong. Hope the bio’s get in gear. What if the Bankers are not able to keep stock prices elevated much longer? Unfortunately , it’s quiet possible that Mike Maloney’s interview with Harry Dent is nothing more than “hot air”. Nether less, Dent is calling for a 80 to 90 percent stock market plunge…due to deflation. I’ve recently seen the video, “The Great Deflation: Investment Strategies for the Next Leg Down”. Several reasons were discussed that pointed towards deflation coming before we see inflation. One being the Baby Boomer generation. The Baby Boomers are a large group that are now beginning to liquidate their assets…basically they have begun the process of CASHING OUT…will the Bankers buy everything the Baby Boomers will be selling? Central banks have demonstrated without a shadow of a doubt that they can lift markets with QE. What they haven’t been able to do is stop the bubbles from forming. The NASDAQ is already green, I hope Yellen will hint in her speech today, that a rate hike is not on the table in April, so it may spark a rally today. The only thing that fueled the equity market since March 2009 was QE. 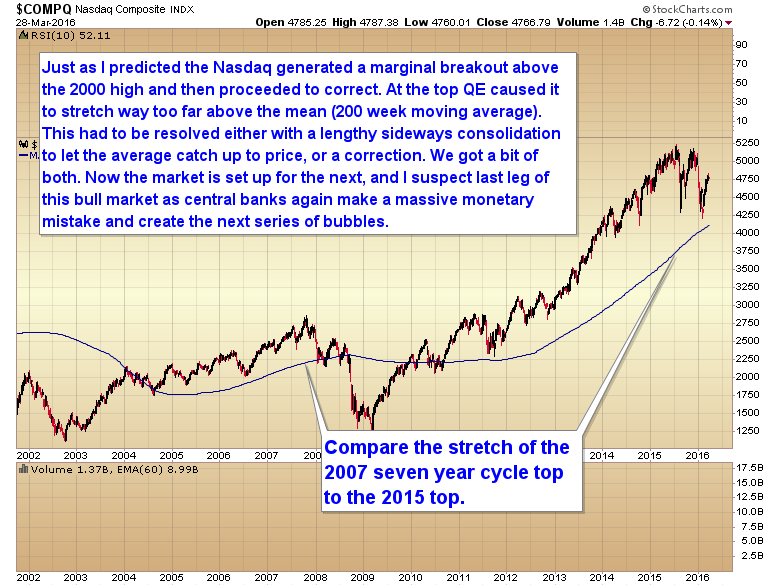 QE ended in Q4 2014. The market is flat since then. And if central banks can lift markets, why is Japan in a 30 year bear market. Europe continues the trend down over the past 18 months.. Remember when the Japanese were buying everything in 1989? Notice that just as soon as Japan started their massive QE program the Nikkei rose almost 150%. Spx also went up 200% off the lows. That’s my point.All central banks have to do is start another round of QE to levitate markets. They’ve shown they can push them up. What they haven’t been able to do is stop the bubbles. Vix is indicating traders see no risk ahead. Not sure why you continue to think folks are buying puts head over heels. Sure you’re not a disgruntled listener of Big Gay Al and Cory “Silly Buns” Fleck? Because I have a subscription to sentimentrader where I get real time data. I don’t try to extrapolate data from an index. You really should get a subscription. It isn’t even that expensive. Every serious trader should have one. The music varies, depending on which volunteer is spinning the discs. This morning’s selections suit my taste nicely. As usual keep an eye oil. Here’s a great site for charting cots against gold, silver, s&P……… you can enter any time period and look at whether the commercials, small specs, large specs were long short.. I like how the miners and gold and hanging in despite the bashing in oil. I’m one day closer to buying the XBI, probably tomorrow I start if not later today after the gym. I’ve seen this story too many times, Gary on a white hot streak at the same time so many doubters. It’s like taking candy from a baby! Oil hasn’t taken a bashing, its been trading sideways. Keeping an en eye on markets and considering various possibilities isn’t “doubting”, just common sense. Common sense?! Wait, what’s that..? The 5 day RSI has reached oversold on oil. During the advancing phase of a larger intermediate cycle DCL’s typically bounce pretty quickly once RSI hits 30 or lower. what number is RSI now? Call it what you want, but it my book a 3.66% drop in a day is a bashing, and so is a 10% drop over four days. It sure hasn’t been getting stronger, and it doesn’t qualify as sideways the last week either. Good luck with the goggles! Fish tail blog. always right, never wrong. I wonder if DUST can get to to $8 within a week or two. Yet you frequent it daily…the hypocrisy it burns. Got that right! It’s surprising how many people come here to throw sand in Gary’s face, only to get spanked time and time again, losing money when they should be getting rich. So glad someone else other than me has the decency to point out the obvious — the trolls that somehow just keep coming back for more.. and never take a moment to appreciate the fact that this guy [Gary] is actually providing incredibly useful information for FREE! Hows that $8 DUST working out today Tom? Biotech … still all about this guy …VRX. Own it but a weak sector. Hope it doesn’t get weaker. In the back of my mind I’m wondering if from a fundamental perspective it is signalling that whomever is elected president will try to put a lid on medical costs (which we all know are horrendous). This would be a fundamental leadership change in the market. That would require the average Dorito-laden, soda drinking Ameritard look several months into the future. Unpossible! PS. I’m ready to buy my XBI too. An interesting choice: Lower cost and live a shorter life? Anyone know when DUST will be doing a reverse split? I assume its already been announced? At the rate its going it will be zero by next Friday if they don’t do something soon. Jorgy? You know anything about a reverse split?? Considering March is the worst month for gold, it really hasn’t been that bad. Several of my miners are sporting very nice charts, complete with bull flag and all. It’s been my opinion that the move down into the ICL may just turn into a long sideways consolidation rather than the sharp move down traders have come to expect from the sector. I’m still holding my GDXJ Old Turkey … I’m not good at short term trading … just adding more when extra funds become available. This rally today increases the odds that a runaway move is starting. I still really like biotech. It appears to be forming a rounded bottom similar to what the miners did. Seems like a runaway move also for gold and miners. Maybe time to buy now before you miss out. No, No, No. You never buy after something has already rallied 90%. Just be patient. We will get an ICL by May. 1) I noticed in your COMPQ multi-year chart , in 2007 the index dipped way below the 200-week moving average by almost 1000 points….but in 2016 recent correction it approached but stopped shy of the 200-week moving average and turned up….Doesn’t this not mean that the correction of 2016 is “not over” yet? 2) If another round of QE is what you expect from the Fed, then why are they jaw boning rate hikes every chance they get? AND, do you forsee the 10-year rate to go down again later if another round of QE happens? If so, how long until QE round starts and how far down will the 10-year rate go and by when in your opinion? IN 2008 we had a financial implosion and a severe bear market started by the housing bubble. We have yet to get the bubble so there is no bear market this time. Just a sharp correction back to the mean before the next phase up (bubble). Where do you see the 10-year bond rate going if new QE round occurs, and by when do you see it? I’m not a bond guy. Sorry. it took a few days longer than I expected, but there it is: EUR moving up again. It may rally quite aggressively from here, with positive consequences for gold, oil, stocks. closed my short gold position with virtually no gain. you gave up…, do you think it’s up to 1300+ now? my thinking we will dip lower in the next days…, I don’t short though…, but keep light on silver, tempting to dump silver miners in good profit…, Thanks Alex. Holding my silver miners, if that helps, above support, no problem here. Never, never, never short a baby bull. The “Committee” needs to be abolished. second that. It is not their fault about the rate decisions because they cannot raise rates when the market is confirming lower rates. But, they are being opaque when they claimed they are being more transparent. They are feeding alot of BS out to the media. Actually, they should not even be making all of these statements to the markets. Looks like the shorts over at Ker are getting clobbered again today. How many times must they get kicked in the teeth before they take my advice and quit trying to short a baby bull. Two positions. Long or on the sidelines. Why is oil down when stocks and gold are up today? On a technical basis, $35 is right around the corner if $38 fails. Traders are waiting for tomorrows oil report, 10:30 am. That’s right Gary, never trade against the trend. I like your commitment. Anyhow by trading against the trend and getting clobbered not only frustrates people but also corrupts their “frame of mind” for future trading. HUI 150 x 185 remains. The push to 190 confirmed this, 250 target. Victor, yes, yesterday’s shallow core PCE of merely +0.1% and today’s Tellen’s remarks have sufficed USX to plunge — a change of character in the market due to fundamental grounds –> best option under such circumstance is to move back to the sidelines. Victor, as to a gold trade: I do not know now. Cycle counting is confusing now. Gold may have extended its DC significantly so that we are now on day 2 while a new high may be charted before the actual IC decline starts. – it is done with a smaller weight , hence lower capital at risk. As to what happened today with USX (and gold in its shadow) was the result of a dovish PCE index reported yesterday –> it relaxed Yellen’s statement today and provided a red-candled follow-through. I miss Jorgy. Too bad he blew up again. It was fun having a teenager around. Victor, I think the IC decline has been postponed by yesterday’s report on core PCE index and the ensuing Yellen’s remarks today so that, yes, you may be right and see gold at 1300 BUT AT THE SAME TIME I THINK WE ARE AT THE BEGINNING OF THE NEW DAILY CYCLE WHICH WILL FAIL and prove left-translated quickly. Psychologically, this is a very dangerous environment for going long gold now: it is the perfect timing for smart money letting retailers get on board buying heavily and preparing to short them. I will renew my short gold trade when I see the IC decline comencing. Gary — This seems unlikely in my opinion but do you think that GOLD could still very well tag $1300? Ps: I’m also looking at a possible H&S which of course has bearish implications and I think Sentiment is also rather bearish at the moment as well, yes? oil down, stocks rally up? What gives? counter trend move by oil or by stocks? and Why? Oh! now I see: It’s The QE TRAIN! and it’s heading this way again.